My husband grills most of the summer, and well he should. He is the Grill Master. 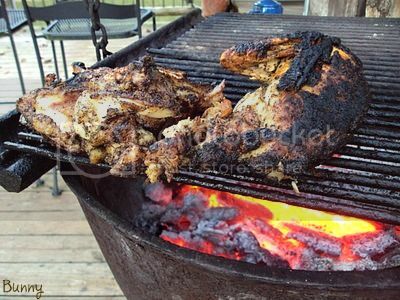 He can grill on a gas grill or on a fire pit and make the most delicious chicken and steak you've ever tasted. To Read More, Click On The Recipe Title. It literally melts in your mouth. Family and friends love to come to our house for dinner knowing that whatever he makes will be superb. My job during the summer when he grills is to make sides worthy of his main course. We've eaten from the garden all summer. Fresh vegetables, salads...pretty much anything in season at the moment. Our fall crop of green beans are here and I really wanted to find a green bean recipe that was over the top good as a side dish for Paul's grilled chicken. I found that recipe on Pioneer Woman , Ree Drummonds Blog. 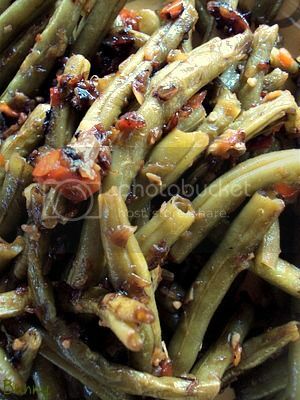 This recipe is the best fresh green bean recipe EVER!! My husband tasted these and declared he wants them every night for as long as he can have them. Which will be quite a while looking at all those green beans in the garden! I've made them for Paul's daughter Leighana and her husband Christian and little Levi, and for our neighbors Jeff and Martha. The response is always the same...FANTASTIC! I couldn't wait to share this with you. The key to making this recipe is to follow Ree's directions to caramelize the onion and the green beans after the broth has evaporated. That's what takes this recipe over the top. You can make these green beans the way Ree did with bacon grease or with olive oil and butter the way I did. Anyway you make them they will be the hit of your dinner. Snap the stem ends of green beans, or cut them off in a big bunch with a knife if you’d like. Just don’t tell Granny. Melt bacon grease in a skillet over medium low heat. Add garlic and onions and cook for a minute. Then add green beans and cook for a minute until beans turn bright green. Add the chicken broth, chopped red pepper, salt, and black pepper. Turn heat to low and cover with a lid, leaving lid cracked to allow steam to escape. Cook for 20 to 30 minutes or until liquid evaporates and beans are fairly soft, yet still a bit crisp. You can add more chicken broth during the cooking process, but don’t be afraid to let it all cook away so the onions and peppers can caramelize. I had tried several homemade biscuit recipes before Paul's daughter Leighana shared this one with me. Of the other recipes Paul would always say...yeah it's good but keep looking. I stopped looking after I made this recipe. 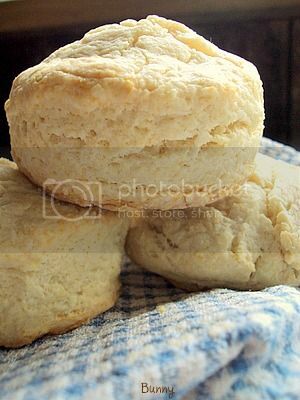 This is a Neely Family recipe and the best biscuit recipe on the planet. 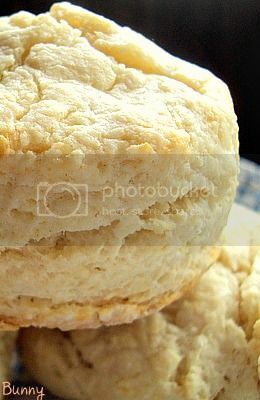 I've had people taste this biscuit, stop in there tracks and say..."These are just like the biscuits my momma use to make." I took these to a Father's Day brunch that Paul's daughter Ciara had made. Her husband Brian tasted his biscuit and said..."Man these are the best biscuits I've ever had." It doesn't get any better in the biscuit world than this recipe. I double the recipe and freeze the biscuits so that I can have homemade buttermilk biscuits whenever my husband wants them. I took some pictures while I was making them to show you the process. The lighting in the kitchen wasn't that great so please forgive the pictures. 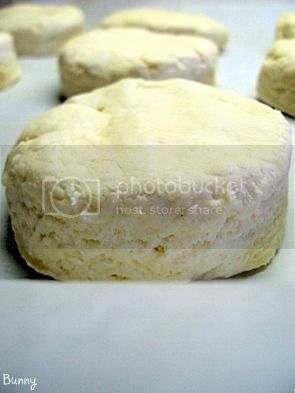 The pictures are of a double batch of biscuits. I'm not gonna show you a separate picture of frozen butter, you know what it looks like. Just take 8 TBLS ( 1 stick) of butter, cut it into small pieces and put it in a bowl or put it on a plate and stick it in the freezer. It doesn't take long for it to freeze, maybe 10 - 15 minutes tops. While your waiting for the butter to freeze, measure out you dry ingredients. 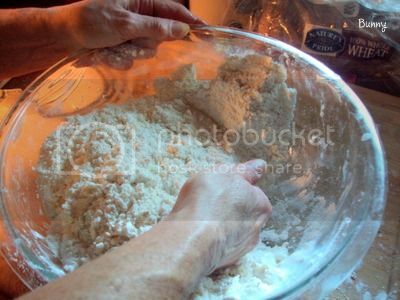 After the dry ingredients are measured out , sift them all together. 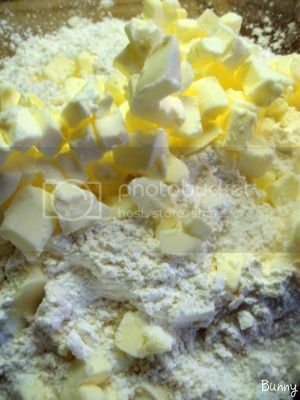 Take the frozen butter out of the freezer and dump it on top of your sifted ingredients. 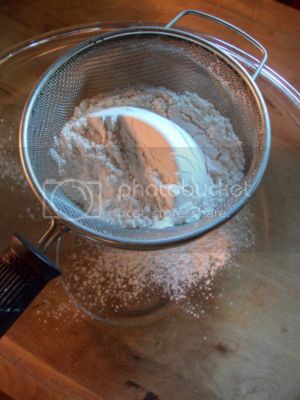 Use a pastry blender to cut the butter into the flour till your flour looks like coarse sand. It'll take a couple minutes , remember the butter is frozen. Measure out the buttermilk and pour it over top of the flour mixture. This is where my method of mixing the flour differs from the recipe. I tried using the pastry blender to blend the buttermilk into the flour. I found that using my hands worked better for me so I just went with it. 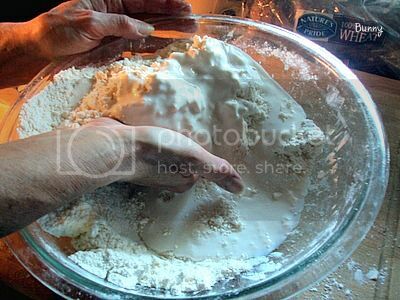 I start by putting my hands under the flour and scooping it up over the buttermilk. It all comes together into a blob. Don't work the dough any longer than you have too, just until it comes together. 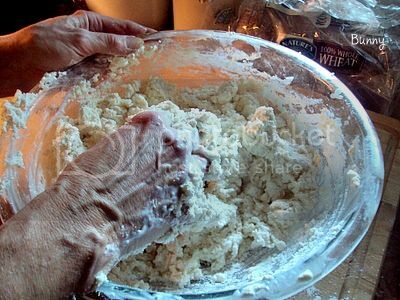 PAT the dough out to the thickness you want the biscuits to be. I generally get 6 biscuits to a batch, I like them nice and thick. 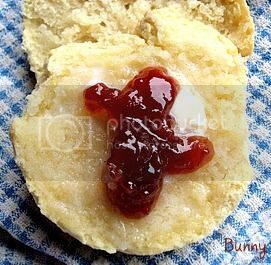 Get your biscuit cutter or use the mouth of a cup or glass to cut the biscuits out. 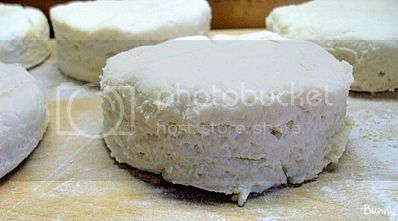 After I've cut out all the biscuits I can with the cutter I gather the dough together and gently make one last biscuit. Its usually not as pretty as the rest but still as good. Get your cookie sheet out, place parchment paper on top of it . Place your biscuits on the paper and put them in the freezer for 20 minutes. If you don't use parchment paper your biscuits will freeze to the pan , you will be left standing there with a spatula trying to unstuck them...ask me how I know that. After 20 minutes the biscuits will pretty much be frozen. At this point you can take them off the cookie sheet and put them into freezer bags or bake them or do a combination of the two. That's why I make a double batch, some get baked, and some stay in the freezer. To bake from the freezer, take out the amount you want, let them sit on your baking sheet ( they should be starting to thaw but still hard) for about 10 minutes and bake as directed. The recipe says to bake these touching each other in the pan but I've baked them when they weren't and they were great as well. Bake at 475 degrees ( make sure your oven is preheated) for 20 minutes. 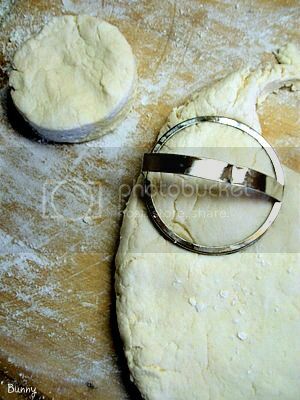 Use a round cutter that has been floured to cut the biscuits. Place in the freezer for at least 20 minutes.Remove biscuits from freezer and place on parchment paper on a baking sheet so they are touching each other. Bake for 20 minutes. Remove from the oven. The weather is turning from summer heat to brisk days and thoughts of leafs turning from green to glorious shades of fall are dancing around in my head. I love this weather. It makes me want to break out my warm sweaters ,sit with big thick socks on and sip on a nice hot cup of cocoa. Paul and I live in the country down in a valley. It's not practical or convenient to just run to the store on a whim. It's six miles up to the highway and another five miles to Kroegers. One reason why food in this house is more homemade than prepackaged. 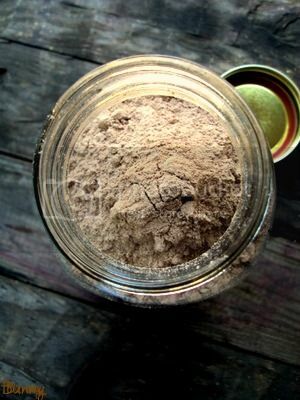 I was tickled pink to find this Homemade Hot Cocoa Mix recipe on Brown Eyed Bakers Blog. Delicious homemade hot cocoa in the time it takes to warm milk, that's what I'm talkin about! Mixing the initial batch took a whole ....maybe 15 minutes. That"s right, this isn't hard...not time consuming...just plain delicious. And the best part, I made it, I know what's in it. What I like best about this recipes is the white chocolate chips mixed into the cocoa, yes white chocolate chips. 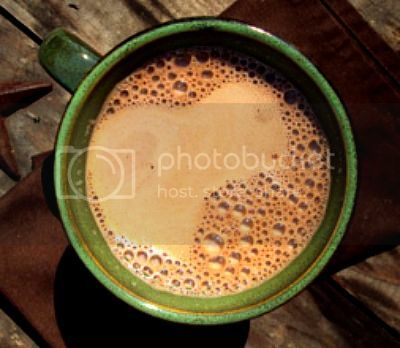 This cocoa is delicious, make it and find an excuse to sit and enjoy it! 1. Whisk together all ingredients in a large bowl. Working in two batches, pulse the ingredients in a food processor until the chocolate is finely ground. Store in an airtight container for up to 3 months. 2. To make hot cocoa, put 1/3 cup of the cocoa mix in a mug and stir in 1 cup of hot milk. Top with whipped cream or miniature marshmallows. From Start to finish each of these recipes would make a wonderful addition. I need to try the biscuits especially. This sounds like a recipe even picky children would eat. Thanks for sharing. Those buscuits look beyond good. I am going to have to give them a try this weekend. The green beans sound really good and the biscuits are making my mouth water. They look so delicious! You had me at biscuit and I too am looking for the perfect one. I have to pin this recipe. I love your blog because you explain everything clearly and you show everything in photos which is very important for beginners like me.